Microsoft Azure is an open platform that can be used for a large number of purposes from Infrastructure as a Service (IaaS ), Software as a Service (SaaS) and Platform as a Service (PaaS). Azure’s flexible and interoperable platform can be used to build new applications to run from the cloud or enhance existing applications with cloud-based capabilities. Its open architecture gives developers the choice to build web applications running on connected devices, PCs, servers, or hybrid solutions offering the best of online and on-premises. Microsoft Azure offers agility along with an open cloud platform, helping you grow your business with greater efficiency and be more responsive to change. With Azure, you can quickly get and running, scale up or down as needed, and avoid high capital costs — paying only for what you use. Azure also works seamlessly with other Microsoft software and services, such as Windows Server, SQL Server, Exchange, and SharePoint, helping you back up and keep your most important company information safe. Azure enables you to quickly and easily move your apps from on-site servers to the cloud. This migration helps you avoid the cost of purchasing new server hardware. The cloud infrastructure helps you easily scale up or down as needed. You also get the added protection of multiple data backups in the geographies you choose. 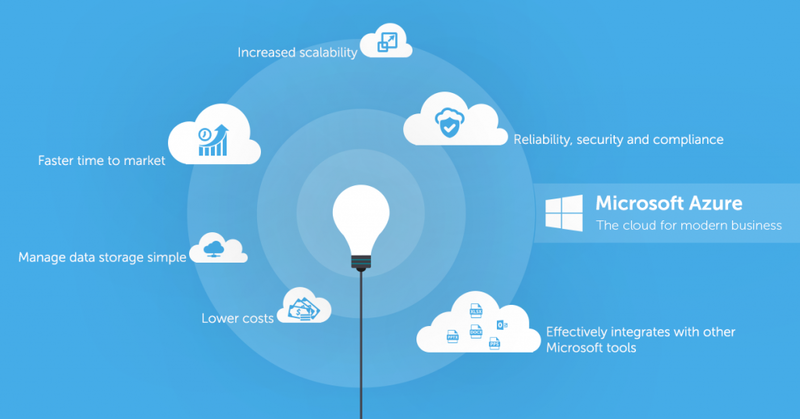 With Azure, you can quickly and easily host scalable websites in the cloud. Microsoft uses global datacenters, helping provide you and your customers a customized experience of usability. With Azure, you can quickly and easily host scalable websites in the cloud. Microsoft uses global datacenters, helping provide you and your customers with a reliable, satisfying, and secure experience without the need to invest in costly infrastructure. Microsoft Azure also offers a wide variety of different analytical tools to analyze your data and make some decisions using the result. One of the very good examples of it is Azure Machine Learning. Intelligent selling can be made possible via machine learning with cross-sell recommendations that allow sales reps to predict which products and services a customer will need during the sales cycle and therefore which products and services to pitch at the appropriate time. With our expertise in Azure and Cloud implementation, we can help you to move your business to the cloud or to scale it with endless cloud features. Companies are facing new challenges regarding their everyday working processes because of the global market, increasingly shorter innovations cycles and a difficult labor market. SharePoint is the most versatile platform ever introduced by Microsoft. The platform includes several components which when used in precise combination can solve most complex challenges. Microsoft SharePoint Server provides a single integrated web-based platform to automate business processes, Promote collaboration among employees, Enhance communication within an organization, Reduce complexity of content management, Improves the quality of business decisions and Facilitates knowledge sharing with searchable repository.